Much of the original machinery in The Ropery is still used to make rope today. The earliest mechanical rope-making-machine to survive in Britain is a forming-machine still in use at Chatham, which was made by Henry Maudslay in 1811. At 1,100 feet long and over 47 feet wide The Ropery houses all of the machinery used in ropemaking. The first floor originally had three spinning frames at each end, the second floor had four and the apprentices had one each in the twin loft. The highly labour - intensive task of laying ropes and cables took place on the ground floor. The forming machine which is the length of the building was pulled by huge winches fixed in the bays at each end. One of the original forming machines delivered to The Ropery in 1811 is still in daily use today. An engine house replaced the Hemp House and a beam machine was installed by Boulton and Watt which transmitted power to the forming and laying houses. 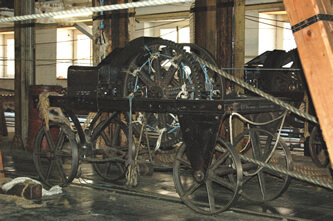 The two most important machines in The Ropery are the forming and closing machines. The forming machine forms strands to make rope and the closing machine is used to close three strands to finish the rope. The first stage of ropemaking was spinning. 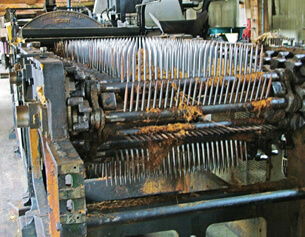 By combing the raw fibres helps to straighten them prior to spinning, this is known as ‘hatchelling’ and was carried out in the Hatchelling House. Next the hemp is spun into yarn by a spinner worker who walked the full length of the Ropehouse.